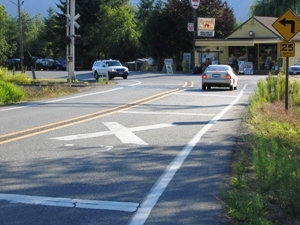 Most of us understand that a quick stop is a primary defense against collisions. Of course, braking needs to be discussed both in terms of rider skill and the type of braking system on the bike. Back in the "good old days," motorcycle brakes were generally so feeble that no one had to worry about skids or "stoppies." But both tires and brakes have been improved to the point where today it's not unreasonable to expect a quick stop with deceleration in excess of 1G. Test riders routinely wring 60-to-0 quick stops from new motorcycles in distances less than 110 ft.
Motorcycle manufacturers have been producing high tech brake systems to help the rider make better quick stops. But whatever the braking system on the bike, it's still up to the rider to recognize an impending hazard, apply the brakes quickly and efficiently, and maintain balance to maximize traction and avoid a spill while the bike is being brought to a halt. The first important lesson about braking is that maximum braking force is dependent upon traction ("friction") between the road surface and the tire. A powerful brake system may be able to stop the wheel from turning, but it's the tire that stops the bike. No one has to convince us that a skidding tire is a big problem on a two-wheeler. The first problem is that more than about one second of front wheel lockup is likely to result in a slide-out. Secondly, a skidding tire has less traction than a tire that is still rolling across the surface. Maximum braking force occurs at around 90% slip. That is, when the brakes are almost, but not quite locking up the wheel. The point is, the shortest stop requires braking to a maximum just short of a complete skid. Since riders can be justifiably nervous about braking too hard on the front wheel, manufacturers have designed systems to help, including linked systems, integrated systems, and Anti-lock Brake Systems (ABS). But before we consider the various "system" approaches to braking, let's review the basic dynamics of braking. Traction is determined by variables such as the roughness of the road surface, the ability of the tire rubber to conform to the surface, surface contamination (sand, oil, water), the slant of the surface, weight distribution on the bike, and the path of the motorcycle. Assuming good, clean, level pavement, good tires, and a straight-line stop, theoretical maximum braking force is equal to the weight pushing the tire down onto the pavement. So, in very general terms, a tire supporting 500 lbs will be able to produce a braking force of 500 lbs. Of course, weight on a motorcycle is shared between two wheels, and the weight distribution between rear and front can change quickly. For instance, carrying a passenger will put more weight on the rear tire. Braking will shift more weight onto the front tire. 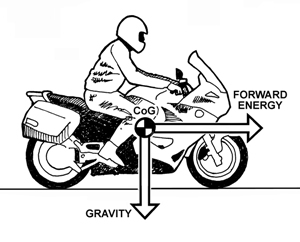 The term Center of Gravity (CoG) refers to the theoretical center of mass (weight) of bike and load. Of course, every piece of bike and load are being pulled down by gravity, but it's easier to discuss if we pretend that all the pieces are balanced at a theoretical center point. As the bike tips to one side, gravity is obvious. What's not so obvious is that the bike and load also have inertia--objects in motion want to stay in motion. A bike and rider speeding down the highway want to keep moving along at the same speed. Unlike gravity, the higher the speed, the greater the kinetic energy. Slap your hand onto a table top, and you'll experience the kinetic energy of your hand trying to keep moving. Slam your hand down faster, and you'll experience the greater impact from the increased kinetic energy. So, when we're discussing braking, we need to consider both gravity and kinetic energy. Gravity is pulling straight down on the bike/rider CoG. Gravity is a constant that doesn't change with speed. Kinetic energy ("forward energy") is pulling straight ahead on the bike, rider, and load. Unlike gravity, forward energy increases or decreases as a function of speed. 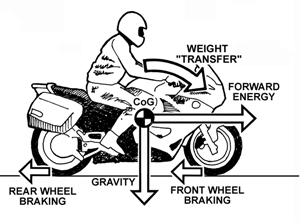 Now, consider that when the brakes are applied, the braking force is down at the tire contact patches (at pavement level), but the forward energy of bike and load (rider, passenger, gear) is centered up at the CoG level. So while the braking forces are pulling back on the tire contact patches, forward energy causes the bike to pitch forward toward the front. We usually refer to this pitching forward as "weight transfer," although it's really a matter of kinetic energy. We all recognize that gravity is pulling the bike and load down toward the surface. Although gravity is a constant, forward energy is a significant force that increases significantly with speed. The point of this is that as the bike pitches forward under braking, rear tire traction decreases, but front tire traction increases. If the front tire has sufficient traction, braking can transfer the entire weight of bike and load onto the front wheel. With braking forces pulling backward on the tire contact patches, and forward energy acting up at the CoG level, the result is the bike pitching forward toward the front wheel. The forward weight transfer means that to achieve maximum braking, the brakes need to be "modulated" (hand and foot pressure adjusted) during the stop. That is, at the beginning of the stop, the brakes might be applied say, 50/50 rear/front. Then as the bike pitches forward, pressure is eased off the rear brake pedal, and the front lever is squeezed harder, perhaps 30/70 rear/front. 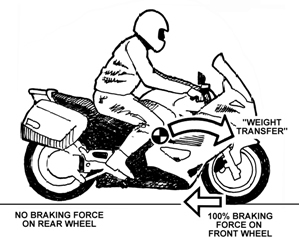 If there is adequate traction, harder front wheel braking (0/100 rear/front) might lift the rear wheel clear off the surface (a "stoppie"). The front tire can be doing 100% of the braking, and if there is sufficient tire traction, squeezing harder on the front brake lever can lift the rear tire off the surface. As we've noted, a skidding tire loses traction and directional control. If the front tire slides out, the rider loses steering control, and therefore balance. Unlike a car, a motorcycle must maintain front wheel traction to stay balanced. If it's a front tire skid the bike typically falls on it's "low side." A rear wheel skid can be even more hazardous. If the rear end slides out, the survival reaction may be to release the rear brake pedal. That allows the tire to regain traction, which can snap the rear end back toward center with considerable force. Enough force to pitch the bike from the low side to the high side, throwing the rider over the top. When the bike and rider are flipped up and thrown in the direction of travel, it's called a "high side." To avoid slideouts, someone (or some system) needs to modulate the brakes during the stop, based on feedback from the bike. With standard independent brakes, the rider must modulate the brakes based on "seat-of-the-pants" feedback from the bike, such as the sound and feel of the tires, the deceleration force, and the attitude of the bike as it pitches forward onto the front tire. If the rider senses a skid, or that the rear wheel is lifting, he or she must ease pressure on the lever or pedal to maintain maximum braking force just short of skidding the tires. 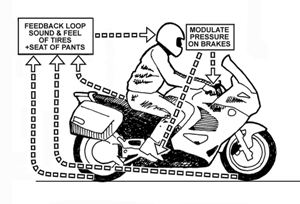 The rider applies the brakes, then modulates pressure on the levers based on feedback such as sounds and feel from the tires, deceleration forces, and bike attitude. With that quick background in basic braking dynamics, we're ready to move on to braking techniques.